SoBigData is a research infrastructure (RI) for ethic-sensitive scientific discoveries and advanced applications of social data mining to the various dimensions of social life, as recorded by “big data”. The research community uses the SoBigData RI facilities as a “secure digital wind-tunnel” for large-scale social data analysis and simulation experiments. SoBigData serves the wide cross-disciplinary community of data scientists, i.e., researchers studying all aspects of societal complexity from a data- and model-driven perspective, including data and text miners, visual analytics researchers, socio-economic scientists, network scientists, political scientists, humanities researchers, and more. The RI provides the common ground for numerous H2020 projects aimed at tackling societal challenges like demographic change and well-being; secure, clean, efficient and integrated transport; Europe in the changing world; digital human. 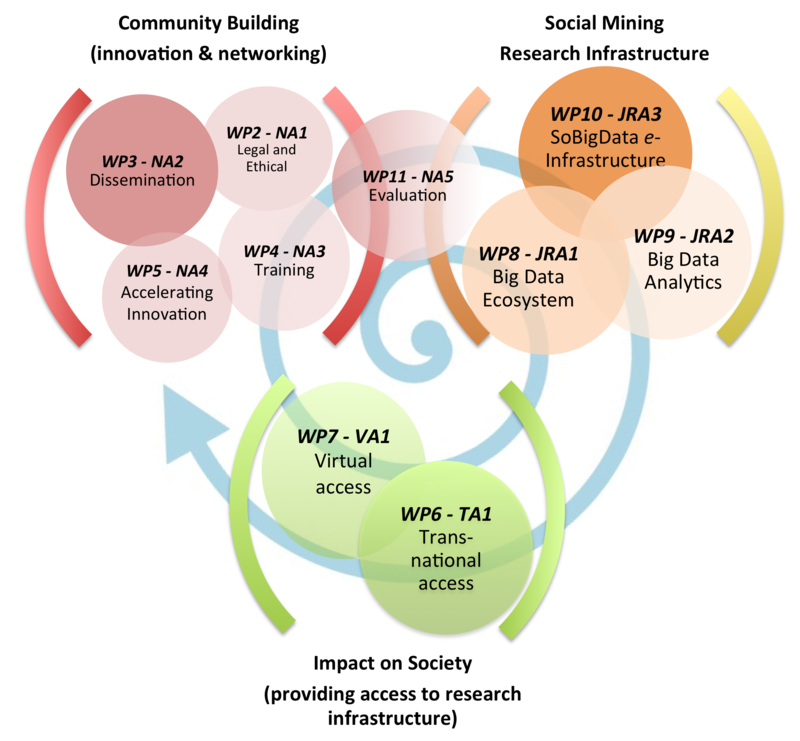 An ever-growing, distributed data ecosystem for procurement, access and curation of big social data, to underpin social data mining research within an ethic-sensitive context. This will be based on innovative strategies for acquiring social big data for research purposes, using both opportunistic means offered by social sensing technologies and participatory means based on user involvement as prosumers of social data and knowledge. A starting community of scientific, industrial, and other stakeholders (e.g. policy makers), supported by transnational and virtual access activities, and brought together by extensive networking and innovation actions (e.g. workshops, summer schools, datathons, training resources in social data mining, knowledge transfer, industrial partnerships). In particular, the training events and resources are aimed at creating a new generation of multi-disciplinary social data scientists, with focus on early career researchers and promoting gender balance.